"Much more than a mere gambling expose, Catch 33 is almost an act in itself! Twenty-first Century magic needs more brains like yours." - Guy G.
3 cards. 2 of them lose. 1 wins. "..simple! "... Or so your audience thinks. Each time he plays the game with you, your spectator falls into subtle traps you've set. He receives an authentic lesson on the con game that is not a game at all. Using beautifully choreographed sequences, you continually manipulate your spectator into choosing the wrong card. He just can't help himself. Perform this routine surrounded; at a restaurant, trade show, or private party. Insert it into a gambling demonstration. Use it when you want audience participation. The majority of Monte routines are story-based and don't allow for spectators to actually play. Designed to fool a room full of lay people, Catch 33 astounds many of the sharpest magicians watching. As a bonus, a Catch 33 performance video is provided as a learned aid. Shown from the audience's point of view, this clip will help you visualize each sequence so you may learn the routine faster. The Hype: This discussion of the basic Monte technique is perfect for those that have never heard of Three Card Monte, and for those with years of Monte experience that need a refresher. You will learn The Mid-Air Lay Down, a basic original pattern. The first time you try it, you'll fool yourself. From there, you will learn The Grecian Turn. This simple original sequence has fooled many of the world's finest magicians on Lee's travels throughout Europe, Asia and all of the Americas. Finally, you'll learn Ripped. With roots in the classic torn corner plot, many have said this sequence alone is worth the price of this ebook. Plus you will get two more phases, the Sosi Switch and Kaiser Con and a Bonus Ploy for when someone picks the right card. They are guaranteed to fool spectators with con game psychology never used in a magical context before. Catch 33 borrows actual moves taken from the real street con and combines them with an entertaining magical approach and excellent psychology. It will surpass all of your expectations. HOW DOES CATCH 33 END? You clearly rip off a corner of the winning Monte card. A spectator holds the torn corner in their hand. Amazingly, the winning Monte card restores itself to a perfect condition on the table. The piece held by the audience member magically changes to a corner of a losing card. You will look like an expert! 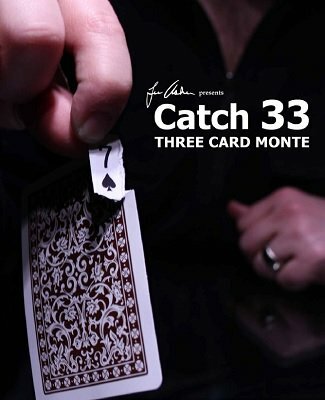 No trick cards used in Catch 33: Three Card Monte . Once you find out how this routine works, you will never want to perform any other 3 Card Monte routine again. 1st edition 2013, 31 pages. Lee Asher has a magical mind that never stops at "that's it" he always seems to be thinking "how can I go 1 step better?" Catch 33 is a great example. Not an everyday, run of the mill monte, but a well thought out and expertly taught routine. Lee has a gift for not being "just another". His DVDs are like short films with tricks instead of a set of hands and a close up mat with a musical track and voice over in the background. He really thinks it out (one step better). He has released several effects in E-Book format seeing this is where technology is taking us and this Catch 33 is a gem among monte routines. I have a passion for 3 card monte and its history. It has fascinated me for years and I have seen many effects used for "real" and for "magic". This one will not let you down. This classic con has deceived the public for many years – and taken their hard-earned cash. It appeals to our impulse to acquire easy money but we constantly lose as the hand is quicker than the eye. The concept is great for the performing magician and when presented well teaches a valuable lesson in the context of an entertaining sequence. Catch 33 teaches more than the basic moves required for such a demonstration. It includes well-researched techniques which I had not previously encountered. The list of standout magicians contributing to this work is long and impressive. Lee Asher has woven various methods into a visual treat of dodges and swindles. He demonstrates how to structure a delightful routine which can be performed close up, in a small venue or at a trade show. This is by far the best book I have read on the Three Card Monte. Lee presents a routine that is action packed and entertaining the entire time. Loads of photos and embedded videos provide you with all the details you need. The torn corner ending is a real kicker. This is probably the most commercial version of a Three Card Monte exposed that I have ever seen. Highly recommended. It will take some practice to get this down, but it is well worth it. Once you get the routine pat, you will have a real worker. Normally, I'm not a fan of three-card monte routines. They normally seem to belie the whole reasoning of magic because of the dependence on dexterity. There's no magical explanation, the hands are just quicker than the eye. This is what street hustlers depend on. Well, that and accomplices. In any case, a project I'm working on needs some gambling-based routines, so I thought I'd revisit the plot. Being familiar with Lee Asher's other work, I know his attention to detail and quality is high. Catch 33 is no exception (aside from one thing I'll mention later). This routine has the same basic plot - find the one different card and you win. Except Asher plays a bit with the construct, and adds a kicker that makes the routine more like magic and less like hustling. The instruction and photography is clear throughout. In the section titled 'The Hype', though, I think some of the sentences were transposed, so following along requires some deciphering. It's nothing too challenging, but you should be aware of it. Hopefully Asher will edit this section for clarity in a later edition. This is a routine for intermediate card handlers, and there's no instant reset, but if you're willing to put in the time and effort, you'll be rewarded. Asher provides some solid magical thinking and nuance to the routine. Some of the moves and subtleties are quite clever, and you may be able to migrate them to other routines. The 'out' Asher provides is extremely good as well - though you probably won't need it, it's good to have insurance. Finally, the background and references provided are good. Overall, it's a great handling of something that many others have failed to deliver. Lee Asher with three cards. One black card and two red. Pick the black card and you win. A classic con. How much effort could it take to teach a routine? If you want a great routine, it takes input from twenty of the most talented people in magic. Add 48 high quality close-up photos and and mix to create a straight-forward, well written routine that ends with a kick. I enjoy learning from books/printed media, but watching the moves in action make learning the routine much simpler. Lee gives me the best of both worlds, providing a link to video showing the routine from start to finish. Do you get the idea that I really like this routine? Like the TV commercials say, "But wait... there's more!" Throughout the document, Lee credits the various moves, tosses in some great quotes (not necessary to learn the magic, but great reading) and ends with a link to a Bibliography giving you more than 150 years worth of writing about 3-Card Monte. Is it good for a newbie? It can be. This is a classic lesson in misdirection, audience management and putting together the moves with a script. The moves aren't knuckle-busters, but they will take practice. If you are willing to invest the time, Lee Asher offers a classic with a new twist that will leave people will an impossible ending. For anyone who is serious about 3 card monte. Fresh ending. Lots of reference material. You can also go to video clip and a big bibliography. Everything with quality takes time so take some time and study Catch 33 carefully.